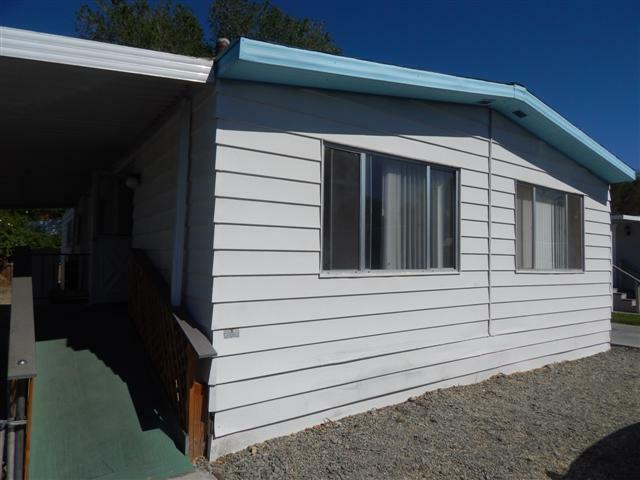 2276 Baskerville Avenue is located in the Highlands Senior Mobile Home Park, in Bishop California. This is a senior living area of Bishop. Property Details for 2276 Baskerville Avenue, Highlands Senior Mobile Home Park, Bishop California. 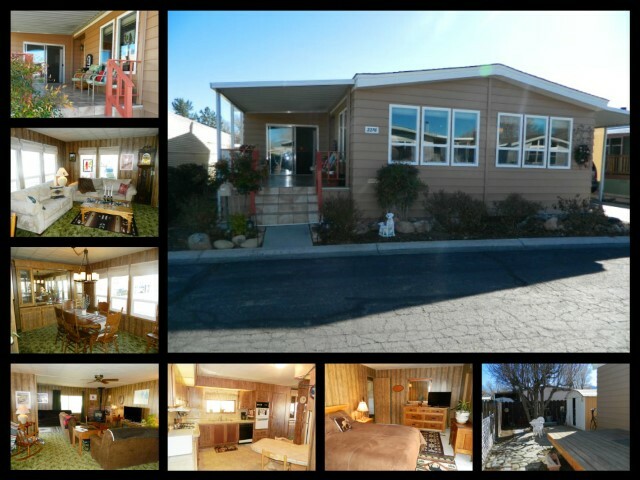 This pristine mobile home is located in Highlands Senior Mobile Home Park. This 2 bedroom 2 bath, plus den home has new dual pane windows, and large open floor plan. The kitchen offers double ovens, stainless steel sinks with garbage disposal, tile counter tops and a dishwasher. Newer pellet stove and evap cooler. Lots of storage throughout the home. Large redwood deck off master bedroom leading you to the backyard, which has slate tiles in throughout the back yard. The backyard offers 2 storage sheds, one with electricity, and a garden area. The front porch has custom Italian marble tile. This home has view of both the White Mountains and Sierra Nevada Mountain Ranges. 2276 Baskerville Avenue is located in Highlands Senior Park is a mobile home community located one mile north of downtown Bishop, CA. Enjoy the quiet and safe surroundings of this neighborhood. Around the park, you will often see neighbors and friends walking dogs while admiring the surrounding mountain views. The mobile homes in this area are well kept and the neighbors are courteous. Residents have use of the clubhouse and community pool. Space rent includes water, sewer and trash. This has got to be one of the best cared for mobile homes in Highlands Mobile Home Park. 2 bedroom 1.75 bathroom with very nice floor plan. Forced air heating and swamp cooler. Shaded patio, spacious yard and storage shed. Highlands Senior Park is a mobile home community located one mile north of downtown Bishop, CA. Enjoy the quiet and safe surroundings of this neighborhood. Around the park, you will often see neighbors and friends walking dogs while admiring the surrounding mountain views. The mobile homes in this area are well kept and the neighbors are courteous. Residents have use of the clubhouse and community pool. Space rent includes water, sewer and trash. Randi Pritchard, Real Estate Professional in Bishop California for Eastern Sierra Realty. Reach us at 760-873-4161. 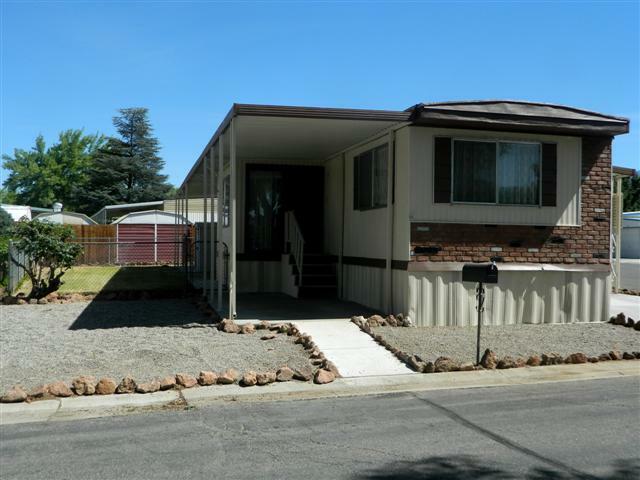 This home is a spacious double wide located in Glenwood Mobile Home Park. Open floorplan, affordable and comfortable. 3 bedroom 2 bath, ceiling fan, propane range, new kitchen flooring. Glenwood Mobile Park is located towards the northern end of the town of Bishop. This is a great area for the older crowd or for the ones looking to start a family and all in between. It is close enough to town but not too close to town. There are several great restaurants in the area, as well as the many that are in town. This is a great town for the outdoorsy type. Lots of great hiking trails, rocking climbing for the adventurous, bouldering, and fishing for those who like to relax.